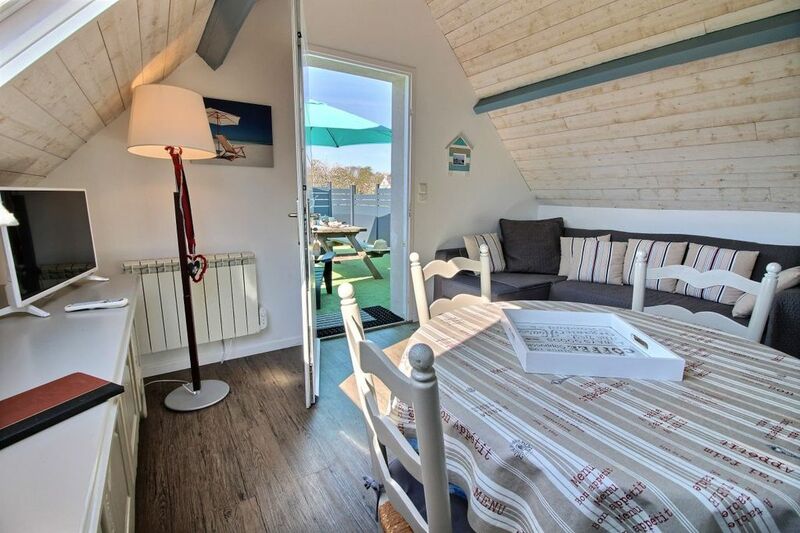 Welcome to our Gîte les Clématites, it is in a green setting, facing the port of Plouer sur Rance. We want to make you enjoy this magical place by its brightness, the bird reserve, the movement of the tides. Painted artists, photographers, do not tire of such a setting. 10 min from the beaches of Dinard, ideally located for walking the banks of the Rance, direct access to hiking trails. Water sports and small beach 800m. 10 km from the medieval town of Dinan. 20 km from Saint-Malo and 45 km from Mont Saint Michel. The apartment 'Clematis' is tastefully decorated and equipped for your comfort. It is located on the 1st floor in a villa overlooking the marina. You will enjoy the changing views offered by tidal movements. We provide a large raised terrace (garden furniture, barbecue, deckchairs), South West exposure. You will be charmed by its fully enclosed garden. Independent entrance. Private parking for your car. Parking motorcycles, bicycles, or other sheltered from rain and wind. Walled garden. Free internet access. Pets allowed if small, a deposit of 75 € is required for the animal. A daily fee of 5 € is required. Bathroom very clear, recent furnishings: shower, 1 basin, WC. For a break in Brittany, put your suitcases in our Gîte les Clématites, spacious apartment, very bright, facing the port of Plouer sur Rance. Quiet and peaceful place. New 2018: A terrace of 15 m2, direct access to the cottage, equipped with garden furniture, parasol, deck chairs, barbecue, exposed South-West. Wir haben eine wunderbare und erholsame Woche im Gîte von Familie Pestel in St. Plouer-sur-Rance verbracht. Die Wohnung ist sehr gemütlich, mit hohem Komfort und liebevoll eingerichtet; sie bietet alles, was man sich für einen Aufenthalt wünscht, inkl. sonniger Dachterrasse. Die Vermieterin ist außerordentlich freundlich, zuvorkommend und behilflich, man fühlt sich als Gast herzlich willkommen. Von Plouer-s-R sind die Highlights der Region schnell und unkompliziert zu erreichen (St. Malo, Dinard, Dinan, Mt. Saint Michel, Côte de Granit Rose, Cap Fréhel, Côte d'Émeraude ...) und die Vielfalt der Ziele (Natur und Orte) bietet für jeden Geschmack und Bedarf etwas. Merci beaucoup pour une semaine très agreable et inoubliable. A bientôt. Je vous remercie pour votre gentil message, la chance a été pour nous de vous recevoir. Nous espérons que vous aurez l'occasion de revenir dans notre jolie région. River Rance, near Saint Malo, Cancale, Dinard. The Emerald Coast. Mont Saint Michel. Dinan medieval city.